The Keys To Riches™ Financial Wellness Series will help transform your current financial habits into healthy money management skills. This is where you’ll find our featured Key for the week from Heather’s Keys To Riches™ Financial Wellness Series. 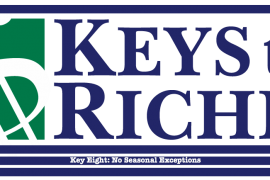 The Weekly Key will be available to our VIP listeners for the entire week. Now that I am on the path to financial independence, I need to see how much I have accomplished or strayed from that goal. I need to evaluate where I am now compared to three months ago. Then decide if I have to alter my plan because I may have new information. I may or may not need to make changes to my current plan. Regardless of changes made, I must recommit myself to my financial independence. I am great at reconciling my finances every quarter. Key Commitment: I commit to quarterly Review, Revise, and Recommit to ensure my long-term vision for financial success is supported by what my daily dollars are doing. Take a pencil to paper and review where we are, ask the three questions and five areas of concern Heather talks about in the Bushido Business Book, and make the necessary revisions, and recommit ourselves to our financial goals.